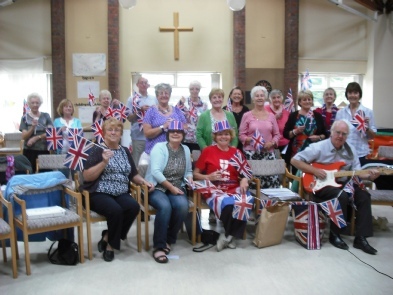 The Singing Group’s version of the Last Night of the Proms. Our version of a St Valentine Celebration. Now this is serious stuff - The group in full voice mode!! We set off on our musical journey with Bring me Sunshine, whilst Cruising Down The River, then Ballad of Wigan Pier followed. We paid tribute to Spring, borrowing the song - Spring, Spring, Spring - from Seven Brides For Seven Brothers. Next - Amore [with] Strangers in the Night. Whilst we Dreamed a Dream with My Guy, but he was off with a Pretty Woman. Little Ole Wine Drinker Me, but not at the YMCA. Didn’t find any bargains in The Old Bazaar in Cairo, but had some Happy Talk. We welcomed two new singers who enjoyed their singing today. 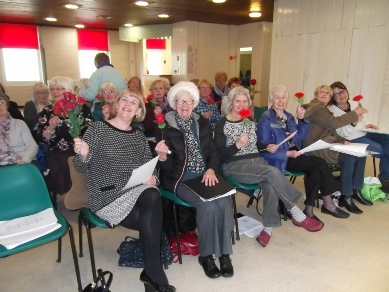 Our next meeting of the Singing for Pleasure Group is – Friday, 13th April. 1 pm at Captain’s Lane. We approached our invitation from Wigan Rotary Club with some trepidation. 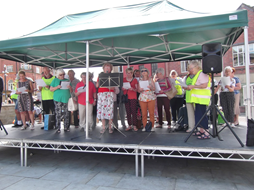 ‘Leading Community Singing in Wigan Town Centre’ as part of annual proceedings aimed at getting the public singing together. ‘Why not?’ Our gallant members of Ashton-in-Makerfield U3A replied when I asked them, not knowing what was expected of us. We took our audience on a musical journey by bus, train and air, even managed a trip in a yellow submarine. The crowds surged up Standishgate as we got into our musical stride singing ‘Delilah’, some spectators sang and danced. Countless photos taken of us singing meant we must be on social media – think that means Face book and Twitter. Our popular War Time medley [arranged by Stephen] went down a storm. 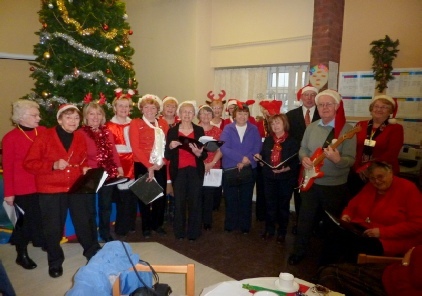 Wigan Rotary Club asked us to sing next year in the same event. Thanks go to Wigan Rotary Club for all their assistance and encouragement, to Heather for her wonderful keyboard backing and to Stephen for his ukulele accompaniment. Our Singing Group in Full Voice. 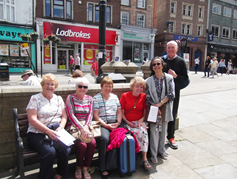 Members of our Singing Group in Relaxing Mode.